Background: Dual-task actions challenge cognitive processing. The usefulness of objective methods based on dual-task actions to identify the cognitive status of older adults has been previously demonstrated. However, the properties of select motor and cognitive tasks are still debatable. We investigated the effect of cognitive task difficulty and motor task type (walking versus an upper-extremity function [UEF]) in identifying cognitive impairment in older adults. Methods: Older adults (≥65 years) were recruited, and cognitive ability was measured using the Montreal Cognitive Assessment (MoCA). Participants performed repetitive elbow flexion under three conditions: 1) at maximum pace alone (Single-task); and 2) while counting backward by ones (Dual-task 1); and 3) threes (Dual-task 2). Similar single- and dual-task gait were performed at normal speed. 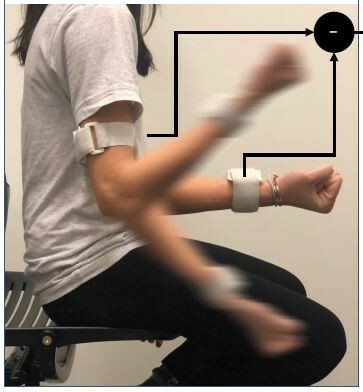 Three-dimensional kinematics were measured for both motor functions using wearable sensors. Results: One-hundred older adults participated in this study. Based on MoCA score <20, 21 (21%) of the participants were considered cognitively impaired (mean age =86±10 and 85±5 for cognitively impaired and intact participants, respectively). Within ANOVA models adjusted with demographic information, UEF dual-task parameters, including speed and range-of-motion variability were significantly higher by 52% on average, among cognitively impaired participant (p<0.01). Logistic models with these UEF parameters plus age predicted cognitive status with sensitivity, specificity, and area under curve (AUC) of 71%, 81% and 0.77 for Dual-task 1. The corresponding values for UEF Dual-task 2 were 91%, 73% and 0.81, respectively. ANOVA results were non-significant for gait parameters within both dual-task conditions (p>0.26). Conclusion: This study demonstrated that counting backward by threes within a UEF dual-task experiment was a pertinent and challenging enough task to detect cognitive impairment in older adults. Additionally, UEF was superior to gait as the motor task component of the dual-task. The UEF dual-task could be applied as a quick memory screen in a clinical setting.